During my time in London, I was an intern for MyDestination travel magazine. One of the many responsibilities I had was to create content for the MyDestination Blog. Here’s one of the latest articles I made for them. Enjoy. ‘You know you cannot be here?’ An Argentinian policeman told us as he stared down at our guilty looking faces. We glanced around at the seemingly abandoned buildings with smashed in windows and graffiti ridden walls, which I imagined was full of expletives in Spanish. I spied a head quickly duck out of sight as my eyes locked his. Standing in a huge pothole in the dilapidated road full of rubble and avoiding a used needle, we knew we had just escaped from being held up at gunpoint. On our third day in Buenos Aires in Argentina, we had enough of sightseeing the huge capital city and simply wanted to catch a few street tango dances in La Boca. Actually, this was where tango started. However, being the extreme budget travellers we were, we didn’t want to take the luxury shuttle there and simply opted to take a local bus with La Boca advertised as its destination. There was a huge tourist area in La Boca where we could browse the quirky stalls, marvel at the colourful architecture and of course watch the dance of passion – the Tango. 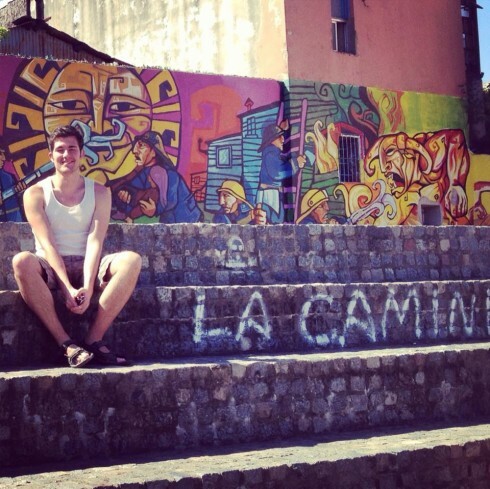 This area within La Boca is called the Caminito. But to our dismay, the bus pulled up at its depot on the other side of La Boca. This meant we would either have to stay put in the seemingly creepy abandoned depot to go back into the city or walk the one kilometre to Caminito. We took the second choice and in hindsight, we were absolutely wrong.